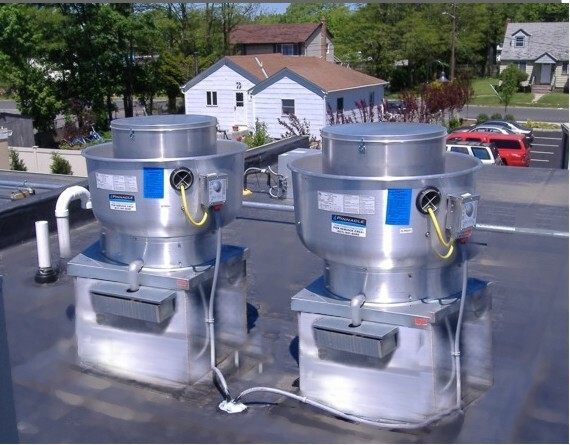 A1 Commercial Kitchen Services inc. carries a wide variety of commercial exhaust fans. Once we know the specifics of what your system will need, WE will figure the fan your hood will need. We sell the best known name brand fans which consist of CaptiveAire and Flo Aire. Kitchen exhaust hood fan, kitchen hood fan is the heart of your kitchen hood system. Exhaust fan/hood fan needs to be serviced on timely basis to get proper air flow from your kitchen hood system. Exhaust fan unit requires lubrication and belt replacement in order to work efficiently. Fan belts crack, break and gets loose. Sometimes hood fan pulley requires repairs. We recommend that you get your hood fan Inspected/serviced along with hood cleaning.